Danby was founded in Montreal, Quebec, Canada in 1947, as a manufacturer of small electrical appliances and compact refrigerators. In 1981, Danby was re-located to Guelph, Ontario. 2007 marks Danby's 60th year in the business of providing quality products to the North American market. Danby's commitment is to provide exceptional quality and value with a continued dedication for creating innovative, unique products that are designed to fit your lifestyle. 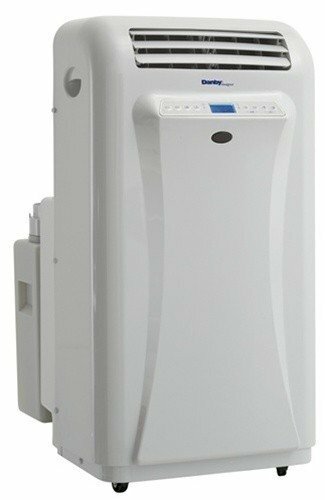 The dual hose portable air conditioners are simply a revolutionary design! During the air conditioning process moisture is condensed and collects in an internal bucket. A dramatic leap forward, this design utilizes the water by showering it over the evaporator coils. The benefits of this shower are twofold: 1) the water does an excellent job of cooling the system thus improving efficiencies and consuming less energy. 2) Showering the evaporator coils accelerates the evaporation process allowing more of the condensed moisture to be expelled outside which in turn almost eliminates the need to empty the bucket. This model also has the added benefit of operating as strictly a dehumidifier during the wet spring and fall seasons or solely as a fan .